Romans is a letter written by the apostle Paul to Christians who lived in Rome, the heart of the Roman Empire and perhaps the most influential city in the world at that time. The Christians in Rome at that time seem to have been more of a community of Christians than a large, fledging congregation since Paul sends many greetings to households of Christians (Rom 16:3-5; 10-11; 14-15) and since the Jews he later meets in Rome seem to know little about the “sect” of Christianity (Acts 28:17-22). Nonetheless, this group of believers was said to have been known all over the Christian world (Rom 1:8; 16:19). The church in Rome was quite possibly founded by Jewish Christians, perhaps by the visitors from Rome who were in Jerusalem at the time of Pentecost (Acts 2:10) or by Jewish Christians who fled Jerusalem from persecution (Acts 11:19). However, the group of Christians in Rome at the time Paul wrote this letter seems to have consisted more of Gentiles (non-Jews) than Jews since he addresses the recipients more so as Gentiles (e.g., Rom 1:5; 1:13-15; 11:13; 11:17-25; 15:15-16) than Jews (e.g., Rom 2:17; 3:9; 4:1). 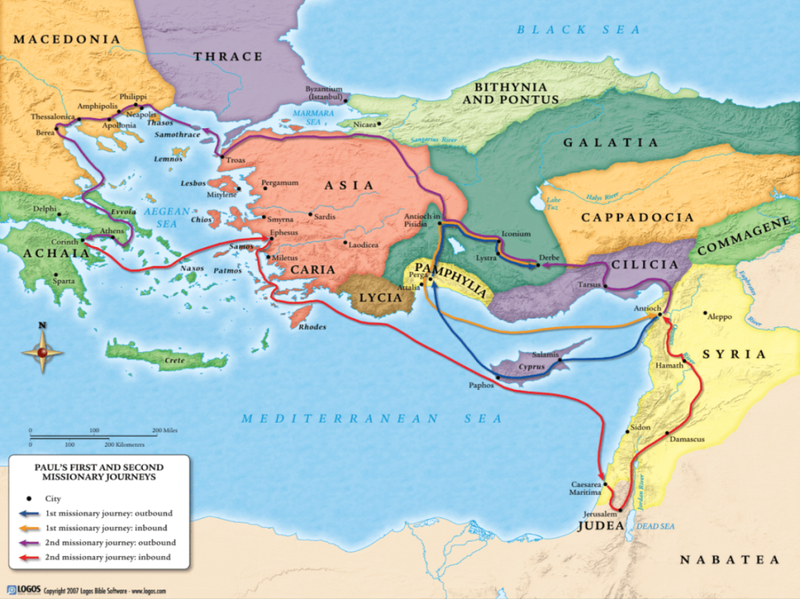 This would fit with the fact that the emperor Claudius expelled Jews from Rome in 49 AD until the time of his death in 54 AD (see Acts 18:2). Thus after Claudius’ death Jewish Christians would have begun returning to Rome, such as Paul’s co-workers Aquila and Priscilla (Acts 18:2; Rom 16:3-5), but were still most likely the minority in the Christian community there. The apostle Paul was a former persecutor of early Christians, but after Jesus appeared to him on the road to Damascus he became a believer and an apostle of the church (Acts 9:1-22). 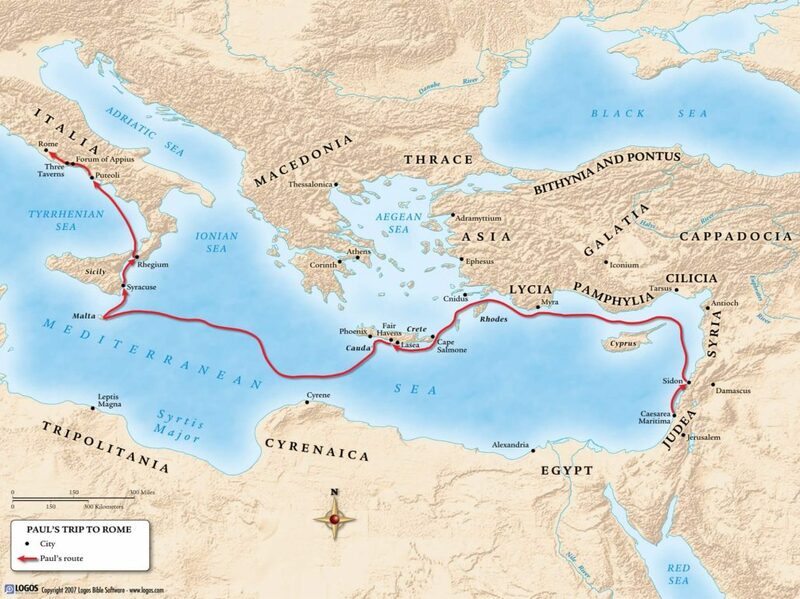 Paul was called to be an apostle to the Gentiles (Acts 9:15; 22:21; 26:17-18; Rom 1:5; 11:13; 15:16; 16:26), and conducted the greatest missionary journeys in the early church, planting and strengthening churches all over Asia Minor and into Europe. Along his journeys and during his later imprisonments, Paul wrote various letters to congregations and to individuals that were eventually circulated and read among all churches. A number of these letters, also called epistles, comprise a large portion of the New Testament in the Bible. From content found within the letter to the Romans itself and also within the book of Acts we can see that Paul wrote Romans in the spring of 57 AD. Here on his third missionary journey Paul states that he has collected an offering for the Christians in Jerusalem and wants to bring it there himself (Rom 15:25-28) after passing through Macedonia and Achaia (Acts 19:21). 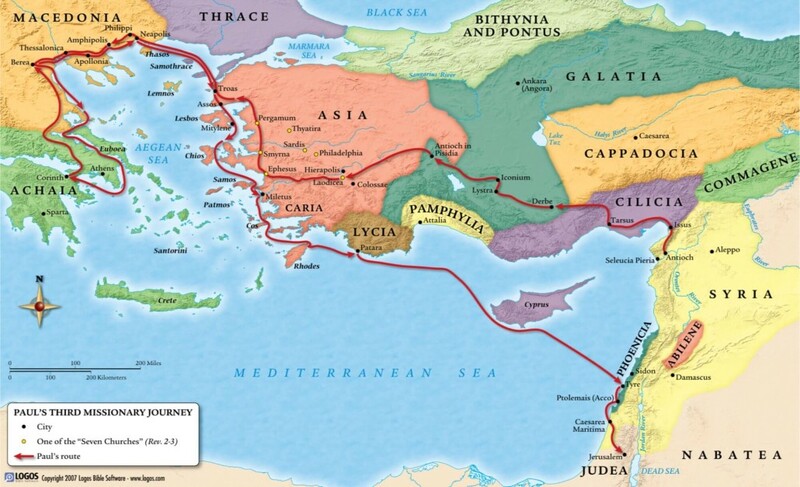 We’re told in the book of Acts that Paul wintered for three months in Greece (Acts 20:3) and eventually sailed from Philippi after the Feast of Unleavened Bread (Acts 20:6), which occurs in the spring, on his way to Jerusalem, hoping to reach it by Pentecost (Acts 20:16), which occurs in the summer. The people he mentions at the end of Romans include Gaius and Erastus, both associated with the city of Corinth (1 Cor 1:14; 2 Tim 4:20), and he sends the letter along with a woman named Phoebe (Rom 16:1-2), who was associated with Corinth’s port city of Cenchrea. Thus from all of this information it seems that Paul wrote the letter from Corinth—or even Cenchrea—in the early spring of 57 AD. 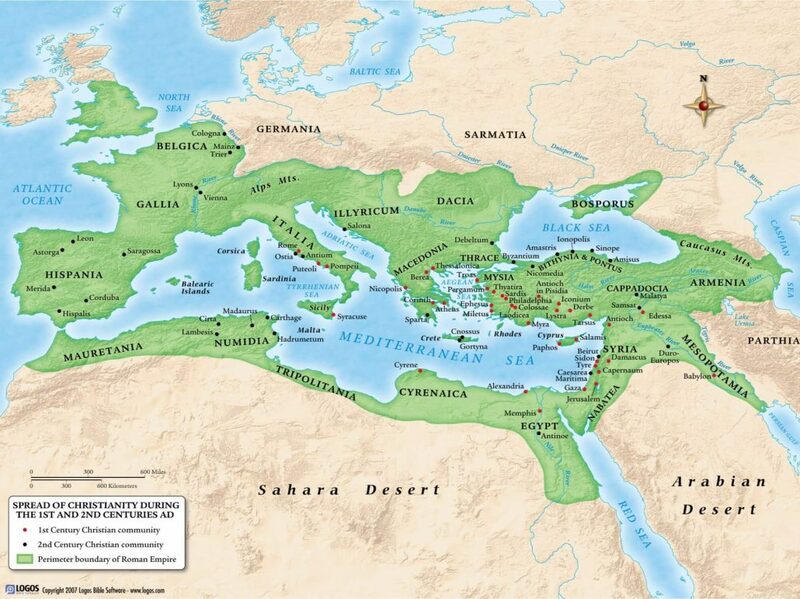 Paul greatly desired to visit Rome and establish a base of operations there that would help him eventually reach even farther west to Spain. Before he arrives in Rome he wants to be on the same page as the Christians in Rome, so he writes this letter to serve as his sort of missionary manifesto, that is, his summary of the gospel message that he has been proclaiming in Asia Minor and plans to continue to proclaim in Europe. Paul later indeed made it to Rome, though he traveled there as a prisoner roughly two years after having been arrested in Jerusalem and roughly four years after writing this letter (Acts 21:17-28:16). Paul wrote his letter as one long explanation or argument concerning the “righteousness of God” and its meaning and effect in a Christian’s life. He shows how we all lack this righteousness (Rom 1:18-3:20), how Christ earned this righteousness and we receive it through faith (Rom 3:21-5:21), how receiving this righteousness transforms a Christian’s life (Rom 6:1-8:39), how the righteousness of God shows through in God’s dealing with Israel (Rom 9-11), how this righteousness is applied in one’s life on earth (Rom 12-15:13), and after some personal greetings he warns against those who would distort the message of this righteousness (Rom 16:17-20). All while explaining the righteousness of God he anticipates counter-arguments that he undoubtedly heard from Jews throughout his mission work, refuting these counter-arguments through the Old Testament Scriptures and plain reason in light of the work of God through Christ. One could mark every passage in the book of Romans as a notable passage, but select passages are listed below.